In 4,400 BBY, Freedon Nadd conquered the planet and established a Dark Side theocracy. These cultists were known as Naddists. Naddist tyrants included Warb Null and King Ommin. The Naddists sent Iziz's criminal element (opponents of the Naddists) out into the wilderness without any protection from the animals. These outcasts soon learned to defend themselves, and eventually formed a second civilization, the Beast Riders. Relations between the two groups were hostile, and they remained at war with each other for many years. The Beast Wars lasted from 4,350 BBY to 4,000 BBY, with the final battles serving as the opening salvos of the Great Sith War. Ommin was coronated King in the year 4,018 BBY, taking Amanoa as Queen. Novar was appointed Minister of State in 4,013 BBY. In 4,002 BBY, Onderon joined the Galactic Republic. The Republic asked the Jedi to watch over the world. Jedi Master Arca Jeth was selected as Watchman, and assigned his Padawans Ulic Qel-Droma, Cay Qel-Droma, and Tott Doneeta to the planet in a test-capacity. The Beast Wars finally ended with the death of Naddist Queen Amanoa. Amanoa's daughter Galia married Oron Kira, the leader of the outcasts, known as the "Beastprince." In 3,998 BBY, two years after the First Battle of Onderon, the Naddist Uprising occurred. The Naddists tried to overthrow Galia, but were foiled by the Jedi and the Republic. Ommin and Sith disciple Warb Null were slain, but so was Jedi Kith Kark. In more ancient times, the sociopolitical situation between the Onderonian beast-riders and the people of Iziz was far different from the present day. Formerly untamed and coarse, many of the wilderness Beast Lords prospered during the several decades since the end of the Great Sith War, thanks to off-world trade going back two generations (marked in the game by Oron Kira's marriage to the Iziz royal house, thus uniting the bloodlines). 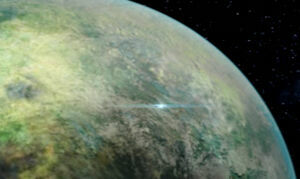 The Mandalorians attempted to invade Onderon during the Krath Holy Crusade in 3,996 BBY, but they failed, and settled on the planet's moon, Dxun. During the Great Hunt, the Jedi cleansed the world of terentateks. Onderon was the site of two battles during the Mandalorian Wars. Onderon, very interestingly, went almost entirely unaffected by the Second Sith War. It was almost as if Revan did not want to attack it. Further, it long remained the only world in the Republic still capable of seeding ecosystems into other dead worlds -- Onderon's wildlife being some of the most aggressive in the known galaxy, particularly its winged drexl creatures flown by the Beast Lords there. Merely placing such creatures on target worlds guaranteed their habitation for years to come. During the years following the Great Sith War and the Jedi Civil War, a good number of the beast-riders became "socialized," influenced by the ways of the city...yet others simply fell to common thuggery, living within the walls, yet unwilling to abide by the laws of civilization. This state of affairs caused many arguments between Queen Talia and General Vaklu during open councils. Talia believed in equality, and a peaceful resolution to the problem. Whereas, her cousin in using the military to resolve matters. Eventually Vaklu's Dark Side ally gave the order for him to seize power from Queen Talia, and thus began the Onderon Civil War. Eventually the war drew to an close, and it looked like Vaklu might overthrow the Queen. The Jedi Exile arrived ,and the tide began to turn back in favor of Queen Talia and her supporters. The Exile commanded royalist supporters and overran the many Sith and Vaklu-loyalist units holding Iziz and the palace. Upon reaching the palace, the royalist supporters and Vaklu-loyalist forces engaged each other within the throne room. By using Battle Meditation, the Jedi Exile swayed the battle in favor of Talia's forces, and all that was left was Vaklu, surrounded by many of Talia's own followers. Talia ordered an immediate execution for Vaklu, but the Exile said that would only make Vaklu a martyr, and that the Queen should use this time to rebuild her planet, and win back the affections of her people. Talia allowed her cousin to stand trial fairly, and thus began the rebuilding Onderon. The robed figure walked down the streets of the planet known as Onderon. Large creatures patroled the skies, and people roamed freely in the streets, chattering as his black robe flew behind him. His sword was mounted on his waist, and grey dust kicked up from beneath his heels. He could hear the tread of a beast of burden trialing him. A voice spoke up, "Hey bud! Pick up the pack, will ya? I got somewhere to be!" The people on the street laughed as the Mouth turned around, "And your destination is of little importance to me, and has no purpose in the grand scheme of things. You have disrupted to peace of this planet, and are interfereing with forces you cannot imagine. You will turn around and leave this city... Now." His voice was warm and calming, but the man on the beast didn't hear him. He only saw his lips. He reached for his blaster at his waist and aimed it, with a shaky arm at the figure. "What... What are you?!" He shhot, but the red light missed, scorching the ground instead, and the mouth was already in motion. He smiled at the man, and did not draw his blade. He look the man in the eye, although the man could not see behind the Mouth's mask, he listened to his words. "You really don't want to do this," he said calmly. "No, you want to go home and calm down. There is no need for violence on this day." The man, however frightened he was by the figures robes, took the words in and they seemed to absorb into his, as he turn around, and proceded to go back to where he had come. There was a thud as one of the Beast Riders landed on the ground and approached the Mouth. "I don't know who you are, or who you serve, but any man you can calm down someone like that, deserves to come and meet the Beast Riders!" The crowed gasped. It was unheard of. A non-Beast Rider, entering the fortress of the Riders, let alone one so hideous. Yes, well, he can send a diplomat down too if he wants. The beast flew the Mouth and the Rider to a cavern, not but three kilometers outside the city. From the outside, the moutain looked like a normal mountain, with a large gap in the center, but the gap didn't seem to go far inward, which indeed it didn't. Not as far as you could tell if you weren't standing on the edge of the entrance. It had seemed like the pair was going to smash into a wall when the beast made a sharp dive down to the caverns below. There was a great hall here, at the end there were two large doors, and there were at least thirty other doors in the hall. The walls were dotted with artifacts, and there was a bright red carpet under them, slthough they were still riding the mount. The edges of the room had a gold trim, and the walls were painted in silver and red color. The cieling had an imense image of a dark beast, with a cloaked man riding it. The hall was wide enough for a beast to flew through and still have room of both sides, and tall though for the beast to go at least thirty meters into the air. They flew smoothly through the hall, and pedestrians waved at the master of the beast as he passed overhead. They grew ever closer to the great doors, and when they within thirty meters of the doorway, they started to creak open, a bright white light that did not faze the Rider or the Mouth seemed to break through the doorway. Inside, there were at least a hundred more of the beasts, although they were not mounted and freely roamed the area. "Welcome, stranger to the home of the Beast Riders of Onderon." The Mouth merely nodded his head, acknowledging the statement. He was too busy staring in awe at the massive beasts. They were of a dark purple tone with large mandible like things on thier faces. They were terrible sights indeed. His master had chosen well if these were to be the future servants of the Confederate. After dismounting the war beast, the rider led the Mouth to chamber on the opposite side of the room. Inside, there was a grand table, and at least one hundred riders were seated there. The Mouth took a seat at the edge of the table. "Well, sir, what is it you need? It isn't everyday we have a guest as special as you at our table." The Mouth smiled in a soothing way at the man seated opposite of him, "What I have come to ask, my friends, is that you join the Confederate... Help us enforce peace, help us create prosperity. You could be saviors to billions of people, and your order could grow... Oh how it could grow! You could become as numberous as the Jedi in thier greatest days! You could create a new Galactic Order. Change your title! Become the Beast Riders of the Confederate and you will become saviors to the galaxy! We are the only ones who can assure you of such a power!" Karh stared out at the tiny Killik ship orbiting Onderon, and turned to his comm officer. He rasied his eyebrows in a question. "Sir, we've got a proptity two message from the President. He wants us to get back to the City. Crisis over." Karh nodded, and the half a dozen multi-kilometre warships turned ponderously and began the runup into hyperspace. Nespis Battlecruisers are at Nespis. The Mouth had been kicked out of the Beast Riders chambers as they debated the fate of Onderon. He expected the answer would come in at least a day, so he had some time to do some exploring to satisfy his hunger for knowledge. He was approaching the exit of the great chamber when a young man approached him, �Where are you going, sir? The teachers have told me you would be attending today�s class.� The Mouth turned around and stared at the child. He saw the child begin to run towards a small door on the side of the chamber. When he was halfway there, the Mouth heard the child call, �Come one, sir! You�ll miss the lesson!� The Mouth quickened his pace; he did not wish to insult his hosts. He entered the door and saw what seemed like a hangar for the great beasts. Twenty beasts stood on the ground, waiting for their rider-to-be to come and begin the ride. A woman in her thirties approached the Mouth. �Welcome, sir. What is your name?� she inquired. His name. Something he dared to tell no one but Flint in case something ever came up. He would give all the politeness he could to this woman and her people, but she had asked for the one thing he could not give her. The Mouth came up with a response at last, �My name is something I do not know. I have been given no name, and I think I shall remain nameless for the rest of my life. My history is but a blur, and I cannot remember my past.� He smirked at his lie. There was a chorus of �Yes� after her question was asked. The group took off. The Mouth was only a moment behind and kicked the beast right above the legs and it took off. He grabbed the reigns of the creature, and kicked it, telling it to go faster to catch up with the group. The creature was happy to hasten itself, it seemed to like to brag. The Mouth looked over and noted the impressive arsenal on the beast. Four laser cannons, one on each wing, and two on the seat, were attached to the beast. The children gasped in fear as the beast above them dropped downward, while on its left side, when the Mouth gave a strong tug on the left reign. He let the reign go and the creature stabilized itself, and he tugged up and the creature flew upward. �Good! Good!� the teacher cried as she noted the Mouth�s control over the creature. His robe flowing behind him, and his sword strapped to his belt, the Mouth was truly a terrifying sight. His beast then let out a terrifying scream, and everything stopped. It seemed as time itself had frozen, but the Mouth knew better then to believe in foolish things such as control of time. Everyone�s beast froze in the air, and three more of the beasts, only these were red, dived at the party. Pirates. The Mouth, told his beast to shoot downwards, and the woman formed up on his tail. The pair shot up and pulled a trigger, beginning a relentless onslaught of laser fire at the pirates. Only one shot met its target, but it hit it on the left wing � one of the few naturally unshielded parts. The first pirate began to plummet to his death, and the other two began chasing after the children, who were steering their creatures back to the caverns. The Mouth tried to catch up, but he was not as skilled as the pirates or the teacher. His beast screeched again. He kicked it three times, and it sped up, and he reached the tail of the pirates. He drew his blade to stab the beast, but the pair fired and hit one of the children�s beast. The child was screaming for help as the massive creature plunged into the depths of the mountainous valley. The Mouth didn�t know how to go down to well, so he tried pushing the beast�s neck � it dove downward. Thank Flint for those holos he gave me for these types of skills� was his thought as he dove. He managed to pass the child, and he landed on his stomach on the Mouth�s beast. He then secured the child by placing the safety belt around him. When the Mouth�s beast pulled up, it shot a massive array of lasers, downing another pirate. The final one wasn�t so easy. Instead of focusing on the fleeing children, he focused on the Mouth. He let out an array of lasers, each nearly hitting the Mouth. He let out another salvo, this one clearly missing, and the Mouth couldn�t focus on firing, he was too busy trying to dodge the enemy�s shots. "The Riders are prepared to see you," a man said as he approached the Mouth. The Mouth turned his head sharply. It had only been twenty minutes since him and his beast had landed from another flight. He smiled though, they had finally decided to accept his offer, or so he thought. He proceeded to follow the man to the room where the officals were waiting. The head stood and greeted the Mouth, "Welcome back. We have you answer." There was a pause. "We have done our research and your kind are scum, and should be treated as such. We will most certainly decline your offer!" The Mouth looked back relaxed. "What are your sources for such allegations, sirs? Did you talk with the people of Onderon to come to this decision?" He took a seat at the table, folding his hands on the table. The man looked back angry, "This council needs no advice from the scum of this planet!" He huffed, and a bead of sweat dropped down his face. His eyes seemed to light themselves on fire. "Well, you would've found out quite a few things about the Confederate... Your sources, the Comm, are filled with lies and propoganda. You see one of our main enemies is Supreme Moff Ams Jendob... Do you know what he does?" The man shook his head. "He is the head of Imperial Propoganda. He isn't a very reliable man, in my experience." The rider looked shocked. His mouth fell open, but no words left it. He was enfuriated. "You come asking for my alliegence, and you threaten me, and insult me in my own home?!" He looked like he was about to explode. "Get out! Now!" The Mouth looked back. "If that is what you wish, I shall leave." He then stood, and walked towards the exit. Although the Council of Riders had banished him from thier temple, they allowed him to keep his beast, which had yet to been named. The Mouth, during his short trip, had been able to sway nine men to join him on his quest to have Onderon join the Confederate. The group of ten mounted thier beasts, the Mouth led the group in a V formation. They were headed away from Iziz, towards the small village of rebels where the Mouth had been born. The town held 946 rebels. The total was 955 when the 9 rebel riders were added to the equation. The group flew over the small town, and the Mouth perched on the wall, anticipating the town guard to come and greet him. It was his hometown after all. What the! You are copying the Lords of Geonosis! I am? I believe I have canon on my side, and BfME2 Modding skillz. Unknown to the Killiks, while the Nespis Battlecruisers had left the 24 Karideph-class light cruisers of the Third Fleet had immediately jumped back and hidden behind an outer moon in the system. Recieving their commander, they began powering out from behind their cover and surged toward the planet with shields up.